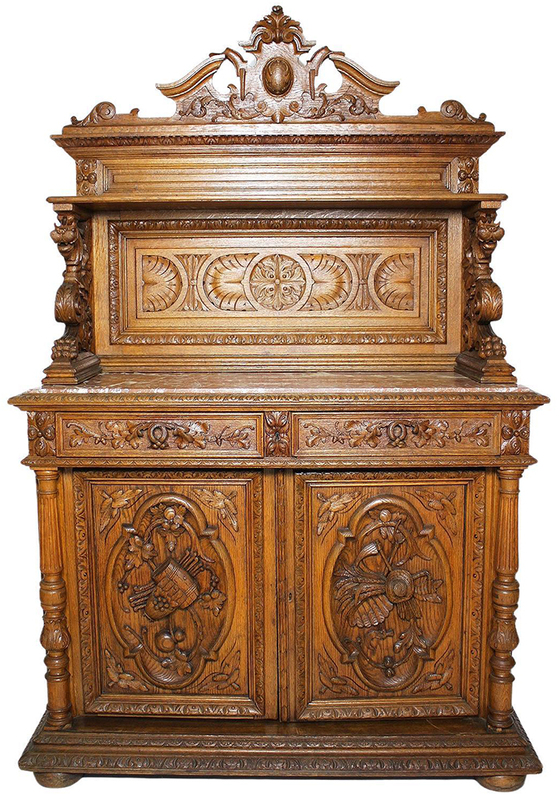 A Fine and Rare Italian 19th Century Baroque Style Oak-Carved Figural Server Cabinet. The upper part crowned with an architectural carving above a paneled shelf, surmounted on each side with a figure of winged dragons, all above a two-drawers and two-doors enclosure with carvings of barrels, vines, flowers, wheat representing the harvest, fitted with a veined Riviera brown marble top. Circa: Florence, 1880. 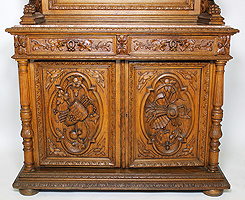 Note: This cabinet is part of a sixteen piece dining suite, however it may be sold separately. 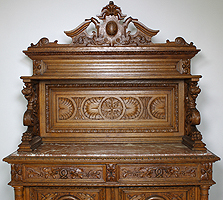 A Fine and Rare Italian 19th Century Baroque Style Oak-Carved Figural Server Cabinet. 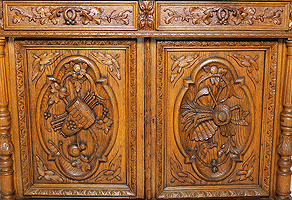 The upper part crowned with an architectural carving above a paneled shelf, surmounted on each side with a figure of winged dragons, all above a two-drawers and two-doors enclosure with carvings of barrels, vines, flowers, wheat representing the harvest, fitted with a veined Riviera brown marble top. Circa: Florence, 1880. Note: This cabinet is part of a sixteen piece dining suite, however it may be sold separately. Please click here to view the rest of the dining suite.